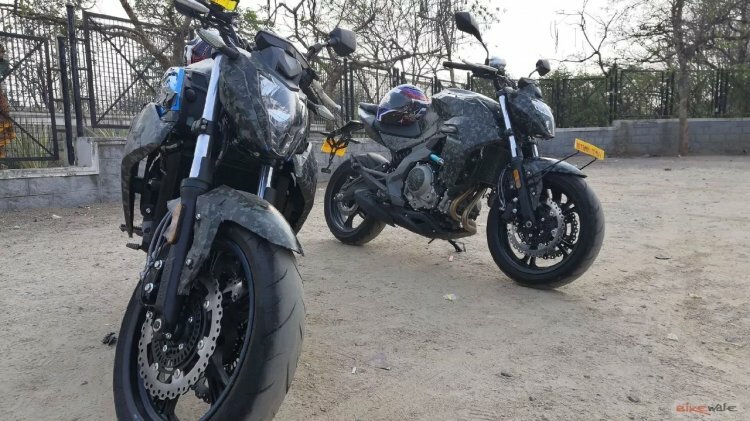 More CFMoto products show themselves on the Indian road and the latest motorcycle to have captured via spy photographs is the 400NK naked roadster. The CFMoto 400NK was spotted in India during its pre-production test runs. The motorcycle would be a part of eight products that CFMoto plans to introduce in the Indian market. The company has joined hands with AMW Motorcycles and aims to introduce as many as eight products in the Indian market. Previously, we saw the CFMoto 650MT tourer, 250NK and the 650NK naked roadsters on Indian roads during their pre-launch test runs in the country. The 400NK looks near identical to the 650NK and the two models could be distinguished with the headlight assembly – with the latter using a projector style illuminator. The 400NK features muscular styling and comes in a dual-tone paint scheme - Athens blue/Pearl black, New Pearl white/Pearl black. The dual-tone theme is visible on the fascia and on the fuel tank. The muscular look of the fuel tank is enhanced with the shrouds and radiator surrounds. A split saddle with step-up design follows the 17-litre tank. Similar to the 650NK, the 400NK uses telescopic forks at the front and an asymmetrically mounted monoshock at the rear to perform the shock absorption tasks. In comparison, the 250NK comes with upside down forks. Stopping power comes from petal-type dual discs at the front and a single unit at the rear. Internationally, the motorcycle comes with ABS as an optional addition although the India bound model would receive the safety feature as standard to comply with the norms. Mechanical specifications include a 400.4 cc, inline 2-cylinder, 8-valve, Liquid cooled, DOHC engine with Bosch sourced EFI system that delivers 40.9 hp of power at 9,500 rpm and 34.4 Nm of peak torque at 7,650 rpm. The motor sends the power to the rear wheel via a six-speed gearbox, and it could propel the 400NK to a claimed top speed of 155 kph. The motorcycle would most likely arrive with BS-VI compliance. The 400NK shares its design with the 650NK although the latter comes with a projector style headlight. Both models use telescopic forks and dual disc brakes at the front. Once launched, the CFMoto 400NK would face competition from the likes of KTM 390 Duke, BMW G310R, Bajaj Dominar 400 and the Kawasaki Z400. CFMoto would import the 400NK via the CKD route and assemble it at AMW Motorcycles’ facility in Hyderabad. CKD route should enable the two-wheeler brand to price its products competitively in the cost-cautious Indian market.